Day 74: Signs of the end. : Eugene, OR to Swisshome, OR | Mike Evans. 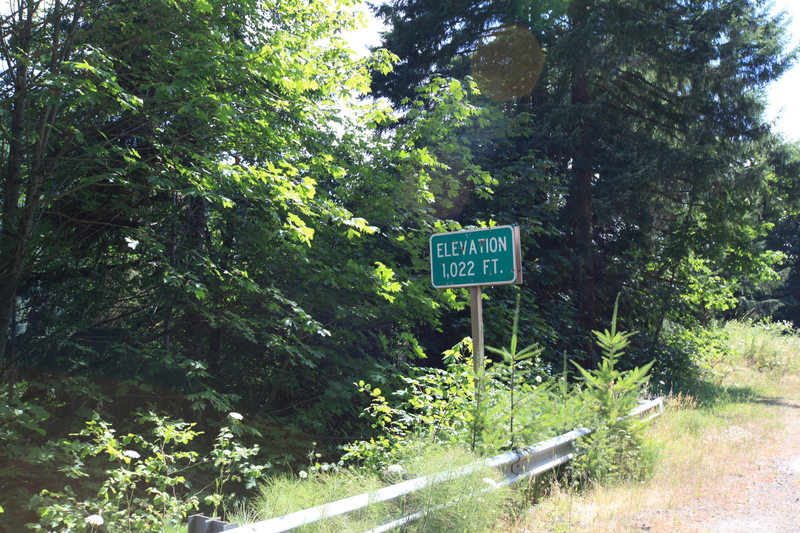 Eugene is a well-intentioned town of biking lifestyle lovers… with a little bit further to go on implementation. The many bike paths are well maintained and superbly marked. Unfortunately, they end abruptly with no warning. Having a bike path down a busy highway that suddenly ends actually creates more of a hazard than no lane at all because it creates the false impression that bikes are no longer allowed. Fortunately, as we cycled out of town, the shared use road bike lanes gave way to a long cycle and jogging only path that wends its way through a wetland wildlife preserve. 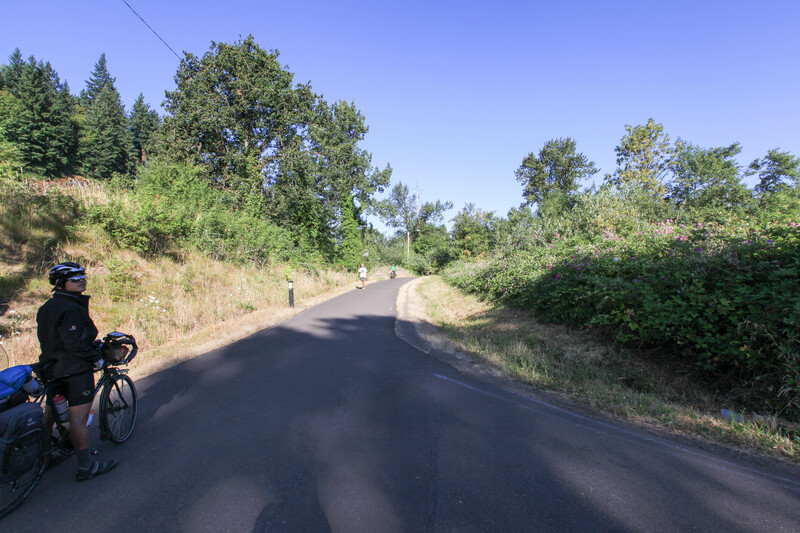 A beautiful bike trail leading into Eugene, OR. 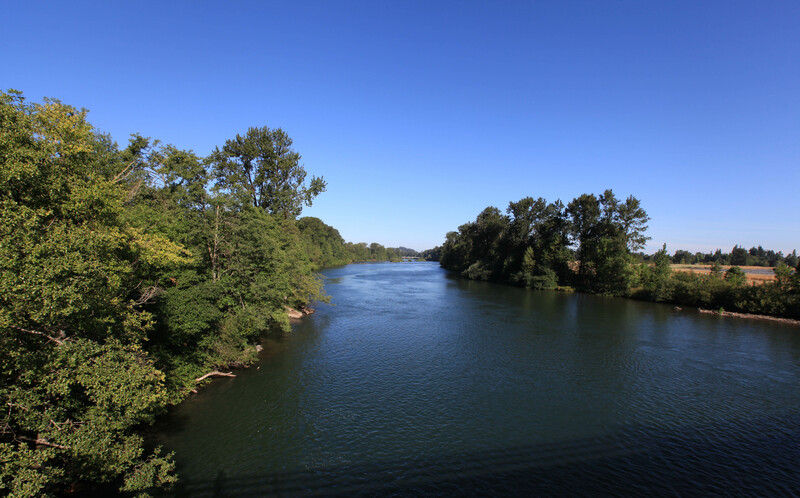 The Williamette River leading into Eugene, OR. 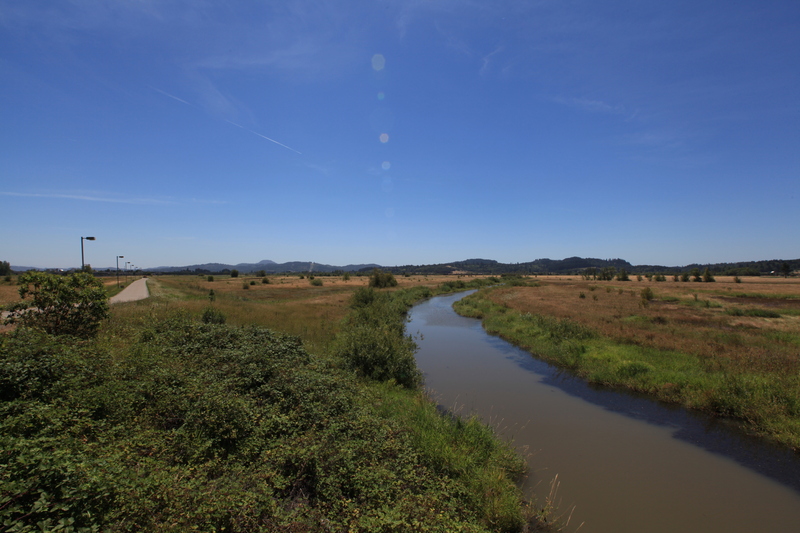 The bike path wends its way through a wetland persevere as we leave the town of Eugene. 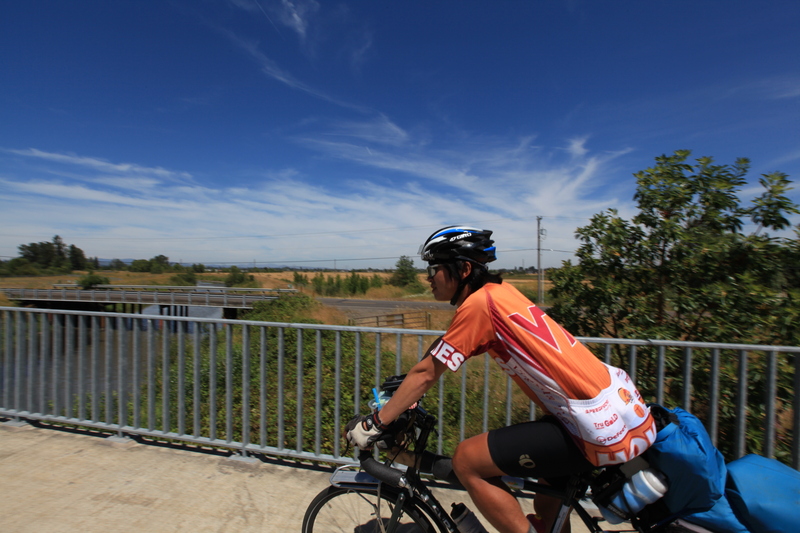 Tuan riding out of Eugene on the way to the coast. It took us a long time to “get out of the farmyard” as Terry says. We hadn’t passed the city limits until almost noon. 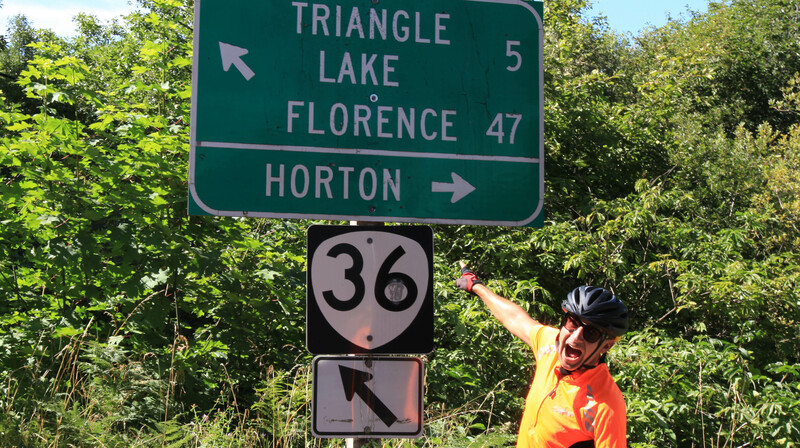 But, with yesterdays mileage eating final push, we have only 80-ish miles to the coast and two days to get there. The plan was to log 60 of that on this, the penultimate day, leaving 20 and change for a final victory lap. After breakfast. I am riding with two Brits, after all, and as exciting as this is, let’s not forget civilization. 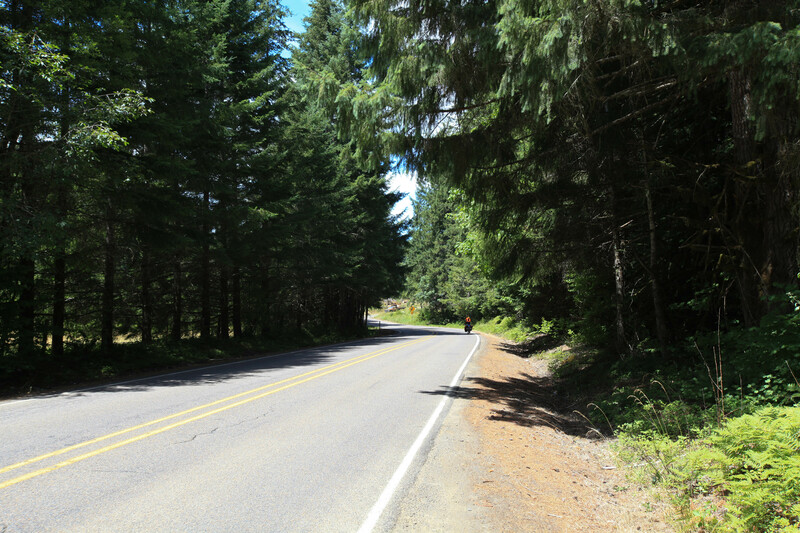 The ride itself was the subdued beauty of the Oregon coast. Beautiful conifers towered above us as we cycled through terrain that was alternately rivers, lakes, and pastures. The road itself was quite narrow, which made for some tense traffic situations, but we take it all in stride as we approach the end. More beautiful riding through the lush lands West of the Cascades. I tried to resist seeing the “last blue mailbox” and “last hill over 150 ft” and other such trivial final millstones. 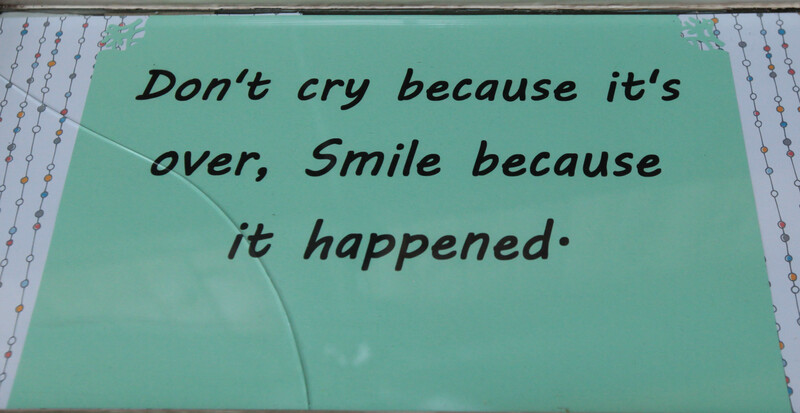 But ultimately the signs around me were literal rather than metaphorical. Ok. For Reals. It’s all downhill from here. 4,100 down, 47 to go. At around 7:00 we setup camp behind a church in Swisshome, Oregon. We’re just 13 miles from the coast as the crow flies, but our horses will cover nearly twice that distance over the final leg of our quest for the Pacific. Over dinner, we all put our gadgets away and reminisced about the people we’ve met on the trip. The stories piled up on top of each other as we each remembered a long chain of wonderful humanity stretching all the way back to the Atlantic. 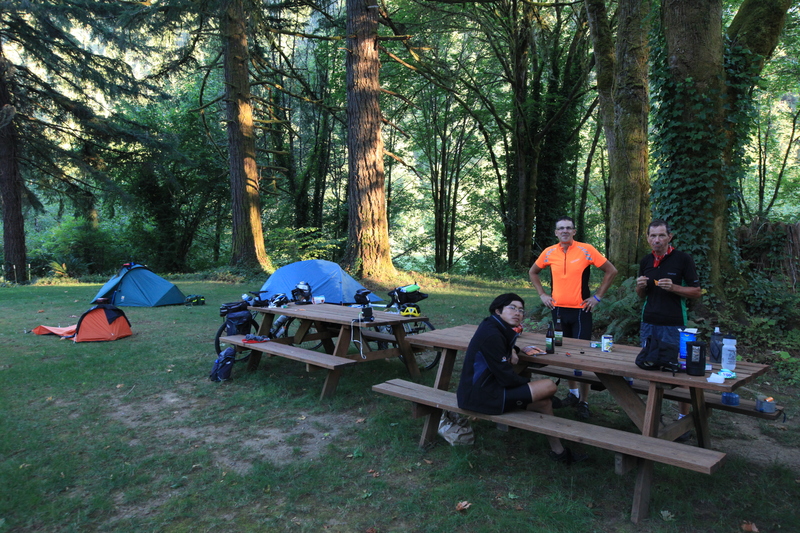 Final campsite with the Brits and Tuan. As I write this, the final activities of breaking camp are all around me. I should be at the coast by noon. I’m equal parts giddy with anticipation of reaching my goal, excited to be reunited with friends and family back home, and sad to be separating from my new friends, Paul and Terry. CONGRATULATIONS! Vicariously, I’ve been with you each day and certainly enjoyed your photos and descriptions. It is a most beautiful, varied, and curious country and one not to be missed. 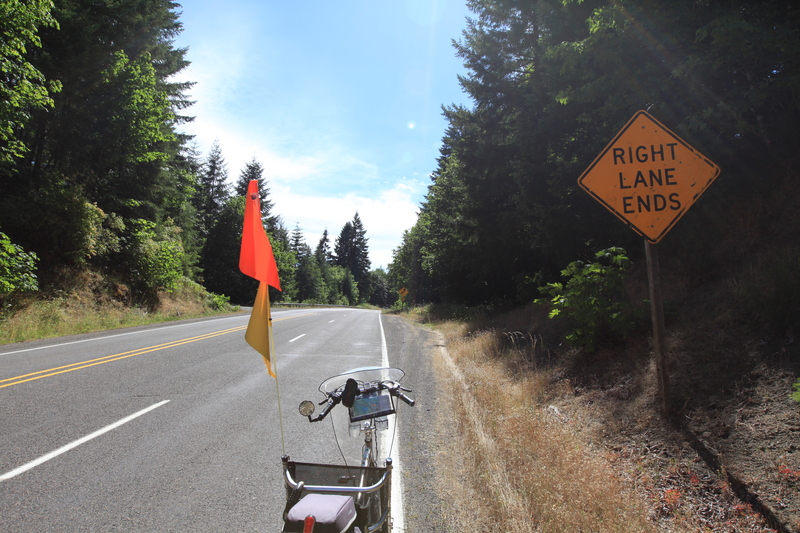 I’ve crossed four times by car, but would have loved to have done it once your way. After tomorrow, it will be hard not look twice to see your daily message. Thanks for sharing your ride with us. Well, I’ll try and find some more interesting stuff to write about, but I agree it won’t be the same as the daily adventure and storytelling that I’ve come to love. Congratulations! I have quietly followed you across the country, dreaming of my crossing. Thank you for sharing with us. I will miss you daily update and adventures. I wish you the best that life has to offer. Thanks for the kind sentiment. The journey has been an experience of a lifetime. I’d encourage anyone to do a similar trip… though 2-3 weeks is probably enough to get a good feel for the experience. You don’t need to take 11 weeks to have an adventure! Congratulations, you conquistador! I hope the end of this successful journey will be the beginning of another … Equally exciting, challenging and successful! I will be missing your daily update but … Every party must end at one point. Best of luck on your next endeavor. *sigh* I’m sad to be done, but excited about reuniting with my friends and family. Thanks a ton. I’ve really enjoyed writing everyday. I hope to keep it up, but it will be tough to find an experience to match this one.